We have two great coffee makers here: Keurig K-Café vs Ninja Coffee Bar. Both models are loved by many coffee drinkers. However, they have a number of distinctive features that set them apart. 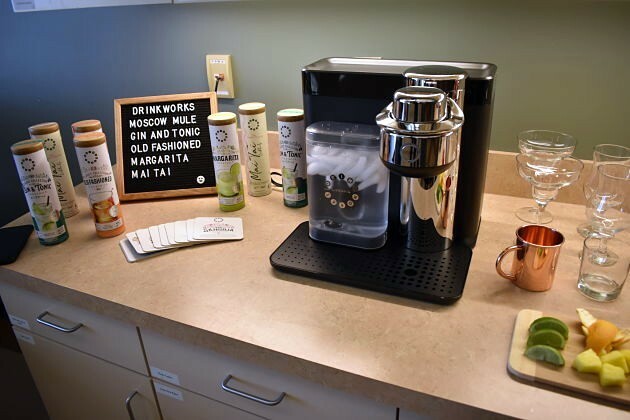 Keurig K-Café works with K-Cup pods, whereas Ninja Coffee Bar takes ground coffee. So, which one is more suitable for you? Continue reading below to find out. The very first thing that you need to consider when choosing between Keurig K-Café and Ninja Coffee Bar is whether you feel more comfortable making your drink from ground coffee or pods. Of course, each method has its own has advantages and disadvantages. But, different people have different needs, so the benefits of one model may be more useful to you than the other model. Keurig K-Café works with K-Cup pods. To make a coffee drink, you need to insert a K-Cup pod into the container and dial the brew style and brew size. The obvious advantage, it is very simple, quick, and practical. You don’t need to grind coffee beans manually, measure the amount of ground coffee, or bother with other technicalities. Everything is set inside the pod, and the machine will automatically adjust the brew settings according to the information from the pod. The unit’s pod scanner will also limit the available brew sizes according to the inserted pod. So, if you enter an espresso-size pod, you won’t be able to brew a 30-oz carafe. This is to ensure that the produced coffee won’t be too weak due to taking too few coffee and too much water. Another advantage is the wide range of beverages offered as K-Cup pods. There are more than 200 options from well-known brands, such as Starbucks, Dunkin’ Donuts, Folgers, and Green Mountain. There are also several different types of beverages, including dark roast, mocha, café latte, decaf, and special blends. However, the disadvantage of Keurig K-Cafe vs Ninja Coffee Bar is that you won’t be able to use freshly ground coffee or customize the brewing process. See also: Mr Coffee Optimal vs Keurig. Ninja Coffee Bar, on the other hand, works with ground coffee. It doesn’t have a grinder, so you need to get a stand-alone grinder in order to grind fresh coffee beans or simply buy ground coffee. It is actually quite practical to use, as you only need to add ground coffee and water, then input the desired brew setting and size. The coffee maker’s Auto-IQ One Touch Intelligence will automatically adjust the water level and intensity according to your input. There are several advantages to this system. First, it can take any kind of coffee as long as it has been ground. You want to choose this model if you are planning to use exotic coffee beans. Secondly, some people believe that using freshly ground beans will deliver higher coffee quality, especially compared to pods. However, you still won’t get customization options, as Ninja Coffee Bar also uses preconfigured brew settings. In addition, it won’t be as practical as Keurig K-Cafe, and the entire brewing process will take longer. For example, if you want to use coffee beans, you need to grind them manually. Then, after brewing the coffee, you may need to add milk or sugar manually. Keurig K-Café, just like most other Keurig machines, won’t really give you strong and intense coffee. Avid coffee drinkers may find the coffee to be rather weak. But it is not too bad. In fact, the coffee flavor is still quite noticeable and enjoyable. Not to mention the fact that this coffee maker can brew many different types of coffee-based drinks with great flavors. The brewing speed is pretty fast. It takes only 2 -3 minutes on average to brew a cup of coffee. Meanwhile, the milk frother usually takes about 3 minutes as well. Ninja Coffee Bar is good in terms of coffee quality. It can make coffee that is balanced and not too strong with the classic brew setting. However, with the right brew setting, it can also make stronger and more intense coffee with enhanced flavor notes that avid coffee drinkers will enjoy very much. The speed depends on the brew style and size that you choose. If you only brew a cup-size classic brew, it will only take 3 minutes. However, brewing a carafe-size café forte can take about 8 minutes. The next difference between Keurig K-Café vs Ninja Coffee Bar is the water reservoir capacity. Of course, you want a large reservoir so that you don’t need to refill too frequently. Both models here have fairly large water tanks that are removable, so they are great for serving multiple coffee drinkers. Keurig K-Café has a slightly larger capacity. The water tank can hold up to 60 oz of water. With this capacity, the coffee maker should be able to brew 5 – 15 cups of coffee before you need to refill the water tank. Refilling is very easy, as the water tank is easily accessible on the side of the unit. The water tank is semi-transparent, hence allowing you to monitor the water level from time to time. Nina Coffee Bar also has a removable water tank for easy refilling, but the capacity is slightly smaller, which is 50 oz. So, if there are several coffee drinkers who make individual cups of coffee, the water tank will need to be refilled more frequently. However, you can also brew a carafe size in one brewing cycle, which can be an ideal solution for serving several people. Another difference of Keurig K-Café vs Ninja Coffee Bar is the available serving sizes. Keurig K-Café can only make single-serve coffee drinks, though it indeed has several brew sizes. On the other hand, Ninja Coffee Bar can brew individual cups of coffee or a carafe size. On the top of Keurig K-Café, you can find several buttons. The brew size buttons are arranged in a circular pattern. This coffee maker can brew 6 oz, 8 oz, 10 oz, or 12 oz coffee. That’s actually great. The larger brew sizes can satisfy avid coffee drinkers. The lack of a carafe brew option is not a problem, unless you want to serve multiple guests and brewing multiple cups of coffee will be too time-consuming. Still, Ninja Coffee Bar is quite more flexible and versatile when it comes to brew sizes. This coffee maker can brew coffee in various sizes to suit every occasion and need. It can brew in Cup, XL Cup, Travel Mug, Multi-Serve, Half Carafe, and Full Carafe. Indeed, its comes with its own carafe. It is ideal if you want to use your coffee maker for serving multiple guests. Keurig K-Café comes with an integrated frother. It is very simple to use. There are three pre-configured buttons that will froth milk for latte, cappuccino, or iced coffee. So, you don’t need to worry about the technical skill needed for frothing milk; it will do the job for you. The performance is pretty good, though you need to use low-fat milk in order to get a decent amount of froth. The coffee maker itself has two different brewing settings for making coffee or latte/cappuccino. It doesn’t need a paper filter. In addition, there is a programmable auto-off function, which will automatically turn off the coffee maker after being idle for some time. Ninja Coffee Bar also comes with an integrated frother, but this one looks more conventional. It is a stick which will rotate when activated. You need to handle the milk properly in order to get decent milk froth. It is a bit more difficult to use if you are not experienced, but it can deliver great results. There are several special brew settings: Classic (the standard balanced brew), Rich (more intense than Classic), Over Ice (designed for making iced coffee drinks that won’t water down), Specialty (for making coffee concentrates), and Café Forte (the most intense and full-bodied brew). This coffee maker comes with a reusable filter. Keurig K-Café measures 15.3 inches wide, 11.7 inches deep, and 12.5 inches tall. It is relatively smaller and more space-friendly. But make sure that you still give it some free space so that you can easily move the handle and access the water reservoir. 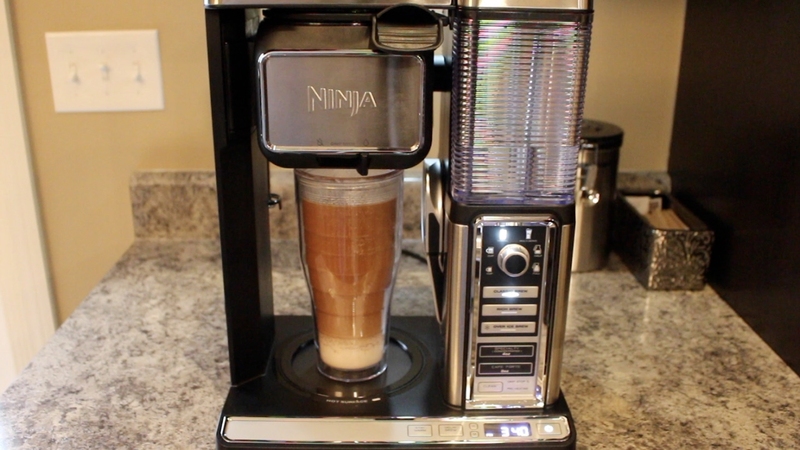 Ninja Coffee Bar measures 15 inches wide, 15.3 inches deep, and 16.3 inches tall. It is really large and bulky. So, you want to make sure that your room has enough space for it. Don’t forget that the frother on the side will also require some more free space, so that you will be able to froth milk easily. 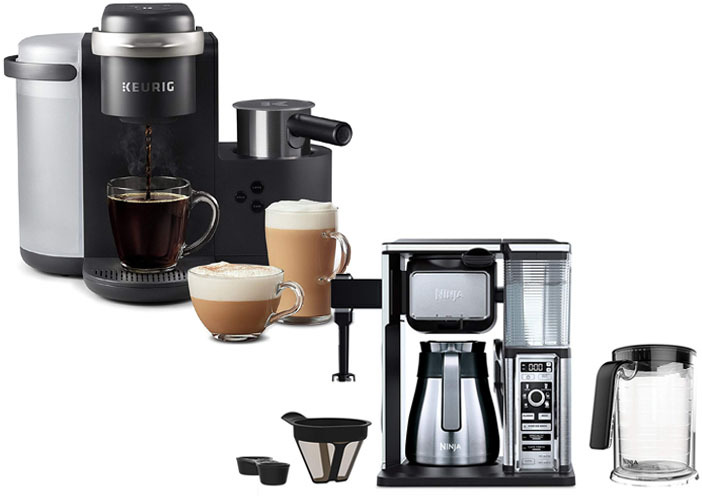 - COFFEE, LATTES & CAPPUCCINOS: Use any K-Cup pod to brew coffee, or make delicious lattes and cappuccinos. - DISHWASHER SAFE FROTHER: Froth fresh milk, including skim, soy, and almond. The frother is dishwasher safe for easy clean up after use. In general, Ninja Coffee Bar is more recommended. It is more versatile. It can brew for various sizes, including mug and carafe sizes. In addition, it is able to brew stronger and bolder coffee with the Rich and Café Forte brew settings. It is also equipped with a milk frother.